Badgers are short-legged omnivores in the families Mustelidae (which also includes the otters, polecats, weasels, and wolverines), and Mephitidae (which also includes the skunks). They are not a natural taxonomic grouping, but are united by possession of a squat body adapted for fossorial activity. All belong to the caniform suborder of carnivoran mammals. The 11 species of mustelid badgers are grouped in four subfamilies: Melinae (4 species, including the European badger), Helictidinae (5 species of ferret-badger), Mellivorinae (the honey badger or ratel), and Taxideinae (the American badger); the respective genera are Arctonyx, Meles, Melogale, Mellivora and Taxidea. Badgers include the most basal mustelids; the American badger is the most basal of all, followed successively by the ratel and Melinae; the estimated split dates are about 17.8, 15.5 and 14.8 million years ago, respectively. The two species of Asiatic stink badgers of the genus Mydaus were formerly included within Melinae (and thus Mustelidae), but more recent genetic evidence indicates these are actually members of the skunk family. Badger mandibular condyles connect to long cavities in their skulls, which gives resistance to jaw dislocation and increases their bite grip strength. This in turn limits jaw movement to hinging open and shut, or sliding from side to side, but it does not hamper the twisting movement possible for the jaws of most mammals. The less common name brock (Old English: brocc), (Scots: brock) is a Celtic loanword (cf. Gaelic broc and Welsh broch, from Proto-Celtic *brokkos) meaning "grey". The Proto-Germanic term was *þahsuz (cf. German Dachs, Dutch das, Norwegian svintoks; Early Modern English dasse), probably from the PIE root *tek'- "to construct," so the badger would have been named after its digging of setts (tunnels); the Germanic term *þahsuz became taxus or taxō, -ōnis in Latin glosses, replacing mēlēs ("marten" or "badger"), and from these words the common Romance terms for the animal evolved (Italian tasso, French taisson—blaireau is now more common—Catalan toixó, Spanish tejón, Portuguese texugo). A male European badger is a boar, a female is a sow, and a young badger is a cub. In North America the young are usually called kits, while the terms male and female are generally used for adults. A collective name suggested for a group of colonial badgers is a cete, but badger colonies are more often called clans. A badger's home is called a sett. Badgers are found in much of North America, Ireland, Great Britain and most of the rest of Europe as far north as southern Scandinavia. They live as far east as Japan and China. The Javan ferret-badger lives in Indonesia, and the Bornean ferret-badger lives in Malaysia. The honey badger is found in most of sub-Saharan Africa, the Arabian Desert, southern Levant, Turkmenistan, and India. The diet of the Eurasian badger consists largely of earthworms (especially Lumbricus terrestris), insects, grubs, and the eggs and young of ground-nesting birds. They also eat small mammals, amphibians, reptiles and birds, as well as roots and fruit. In Britain, they are the main predator of hedgehogs, which have demonstrably lower populations in areas where badgers are numerous, so that hedgehog rescue societies do not release hedgehogs into known badger territories. They are occasional predators of domestic chickens, and are able to break into enclosures that a fox cannot. In southern Spain, badgers feed to a significant degree on rabbits. Hunting badgers for sport has been common in many countries. The Dachshund (German for "badger hound") dog breed was bred for this purpose. Badger-baiting was formerly a popular blood sport. Although badgers are normally quite docile, they fight fiercely when cornered. This led people to capture and box badgers and then wager on whether a dog could succeed in removing the badger from its refuge. In England, opposition from naturalists led to its ban under the Cruelty to Animals Act of 1835 and the Protection of Badgers Act of 1992 made it an offence to kill, injure, or take a badger or to interfere with a sett unless under license from a statutory authority. The Hunting Act of 2004 further banned fox hunters from blocking setts during their chases. Badgers have been trapped commercially for their pelts, which have been used for centuries to make shaving brushes, a purpose to which it is particularly suited owing to its high water retention. Virtually all commercially available badger hair now comes from mainland China, though, which has farms for the purpose. The Chinese supply three grades of hair to domestic and foreign brush makers. Village cooperatives are also licensed by the national government to hunt and process badgers to avoid their becoming a crop nuisance in rural northern China. The European badger is also used as trim for some traditional Scottish clothing. The American badger is also used for paintbrushes and as trim for some Native American garments. Controlling the badger population is prohibited in many European countries since badgers are listed in the Berne Convention but they are not otherwise the subject of any international treaty or legislation. Many badgers in Europe were gassed during the 1960s and 1970s to control rabies. Until the 1980s badger culling in the United Kingdom was undertaken in the form of gassing, allegedly to control the spread of bovine tuberculosis (bTB). Limited culling resumed in 1998 as part of a 10-year randomised trial cull, which was considered by John Krebs and others to show that culling was ineffective. Some groups called for a selective cull, whilst others favoured a programme of vaccination. Wales and Northern Ireland are currently (2013) conducting field trials of a badger vaccination programme. In 2012 the government authorised a limited cull led by the Department for Environment, Food and Rural Affairs. However it was later deferred and a wide range of reasons given. In August 2013 a full culling programme began whereby it was expected that about 5,000 badgers would be killed over six weeks in West Somerset and Gloucestershire using a mixture of controlled shooting and free shooting. (Some badgers were to be trapped in cages first.) The cull caused many protests, with emotional, economic and scientific reasons being cited. The badger is considered an iconic species of the British countryside and it has been claimed by shadow ministers that "The government's own figures show it will cost more than it saves...", and Lord Krebs, who led the Randomised Badger Culling Trial in the 1990s, said the two pilots "will not yield any useful information". Although rarely eaten today in the United States or the United Kingdom, badgers were once a primary meat source for the diets of Native Americans and European colonists. Badgers were also eaten in Britain during World War II and the 1950s. In some areas of Russia, the consumption of badger meat is still widespread. Shish kebabs made from badger, along with dog meat and pork, are a major source of trichinosis outbreaks in the Altai Region of Russia. In Croatia, badger meat is rarely eaten. But when it is, it's usually smoked, dried, or served in goulash. In France, badger meat was used in the preparation of several dishes, such as Blaireau au sang, and it was a relatively common ingredient in countryside cuisine. Badger meat was eaten in some parts of Spain until recently. In medieval times, badgers were thought to work together to dig holes under mountains. They were said to lie down at the entrance of the hole holding a stick in their mouths, while other badgers piled dirt on their bellies. Two badgers would then take hold of the stick in the badger's mouth, and drag the animal loaded with dirt away, almost in the fashion of a wagon. In Europe, badgers were traditionally used to predict the length of winter. The badger is the state animal of the US state of Wisconsin and Bucky Badger is the mascot of the athletic teams at the University of Wisconsin–Madison. The badger is also the official mascot of Brock University in St. Catharines, Ontario, Canada; The University of Sussex, England; and St Aidan's College at the University of Durham. The viral video Crazy Nastyass Honey Badger became popular in 2011, attaining over 68 million views on YouTube as of July 2014[update]. The video features footage from the Nat Geo WILD network of honey badgers fighting jackals, invading beehives, and eating cobras, with a voiceover added by the uploader, "Randall". As a sub-series of the Sonic the Hedgehog franchise, Sticks the Badger is one of the main characters of the Sonic Boom series. ^ a b c Law, C. J.; Slater, G. J.; Mehta, R. S. (1 January 2018). "Lineage Diversity and Size Disparity in Musteloidea: Testing Patterns of Adaptive Radiation Using Molecular and Fossil-Based Methods". Systematic Biology. 67 (1): 127–144. doi:10.1093/sysbio/syx047. ^ a b Yu, L.; Peng, D.; Liu, J.; Luan, P.; Liang, L.; Lee, H.; Lee, M.; Ryder, O.A. ; Zhang, Y. (2011). "On the phylogeny of Mustelidae subfamilies: analysis of seventeen nuclear non-coding loci and mitochondrial complete genomes". BMC Evol Biol. 11 (1): 92. doi:10.1186/1471-2148-11-92. PMC 3088541. PMID 21477367. ^ Cahalane VH (1950). "Badger-coyote "partnerships"". Journal of Mammalogy. 31 (3): 354–355. doi:10.1093/jmammal/31.3.354-a. ^ Macdonald, David W.; Newman, Christopher; Nouvellet, Pierre M.; Buesching, Christina D. (15 December 2009). "An Analysis of Eurasian Badger (Meles meles) Population Dynamics: Implications for Regulatory Mechanisms". Journal of Mammalogy. 90 (6): 1392–1403. 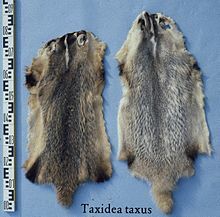 doi:10.1644/08-MAMM-A-356R1.1 – via jmammal.oxfordjournals.org. ^ Fedriani, J.M. ; Ferreras, P. & Delibes, M. (1998). "Dietary response of the Eurasian badger, Meles meles, to a decline of its main prey in the Doñana National Park". Journal of Zoology. 245 (2): 214–218. doi:10.1111/j.1469-7998.1998.tb00092.x. hdl:10261/50745.